Juniors Sarah Noyes and Aitana Mendiguren raced on the Potomac River at GW Women's Invite last April. Sailing fell short of a national championship berth at a team racing conference championship this weekend. 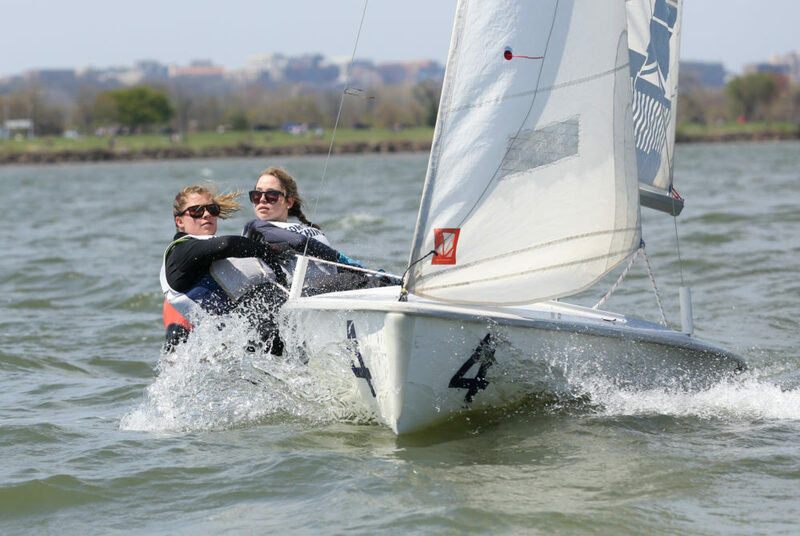 The Colonials tied for sixth at the Prosser Trophy regatta, missing a top-four finish at the Mid-Atlantic Intercollegiate Sailing Association Team Racing championship that would have qualified them for the Intercollegiate Sailing Association Team Race National Championship in May. The squad has eight competitions left this year, but this weekend was its last chance to secure a spot in the team racing national championship. The team’s finish this weekend marks its lowest finish since 2016. GW qualified for the national championship for the first time in program history last season with a second-place finish at the Prosser Trophy regatta. GW fell to eighth place in 2016 and rose up to a fifth-place finish in 2017. The Colonials entered the regatta placing in the top half in four of its six regattas in its spring season. In the first round Saturday, the Colonials took three wins but hit a three-race skid against Georgetown, Navy and Old Dominion. The squad finished the day tied for fifth, positioning themselves one spot short of qualifying for the national competition. The Colonials stumbled through competition Sunday, losing five of their seven races. The team captured a win against No. 1 Georgetown and Cornell, but the Colonials could not square up to their conference foe, tying for sixth place with No. 18 St. Mary’s College of Maryland. The team’s 35.7 racing percentage in the qualifying regatta was the second lowest of the season behind the team’s 15.8 racing percentage at the Bob Bavier Team Race last month. It was also down from the team’s average racing percentage of 42.85. The Colonials came into the regatta riding a high wave. The No. 9 women’s team earned a program-high fourth-place finish at the Dellenbaugh Women’s Trophy regatta. The team won over No. 5 Cornell and No. 7 MIT and lost to No. 8 Harvard with a three-point difference. Sailors said the team relied on senior leadership and focused on scouting out the racing venue and correcting errors heading into competition. Senior Connor West said the spring season revealed the team’s struggles with inconsistency and allowed it to correct the errors heading into the weekend. West said in an effort to clean up the team’s errors, the squad spent time practicing on the water and analyzing practice and competition video. Assistant coach Catherine Shanahan said the team had been discussing the conditions of the qualifying course at St. Mary’s throughout the season to have a “home field advantage.” The Colonials attended St. Mary’s for two regattas this season, and the team practices there frequently. The Colonials sent five seniors, two juniors, one sophomore and one freshman to the qualifying regatta. Shanahan said the seniors, who make up nearly half of the 29-man roster, have carried the younger side of the team throughout the season. “The dynamics have been a constant rotation, and it’s been really helpful to see the fluidity of everything going forward,” she said. Senior Riley Legault said the team has a deep roster that pushes each other in practice and better prepares each other for tough competition. Ahead of the qualifying competition, Shanahan said the team looked back to the basics of racing and staying focused on its sailing abilities. “We’ve proven ourselves at every event thus far, so if we show up and sail our best, we’ll definitely finish in the top four,” Shanahan said. The women’s team heads to Alexandria, Va. to host the GW Women’s Invite Saturday and Sunday, while the co-ed team will compete at the Navy Spring Coed Regatta in Annapolis, Md.